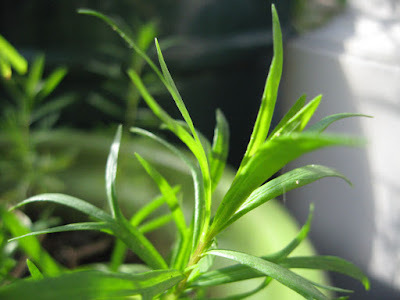 Last month we discussed the flavorful aspects of Wild tarragon (Artemisia dracunculus) and suggested some simple ways to use it in your cooking (http://mother-natures-backyard.blogspot.com/2018/01/california-gourmet-wild-tarragon.html). 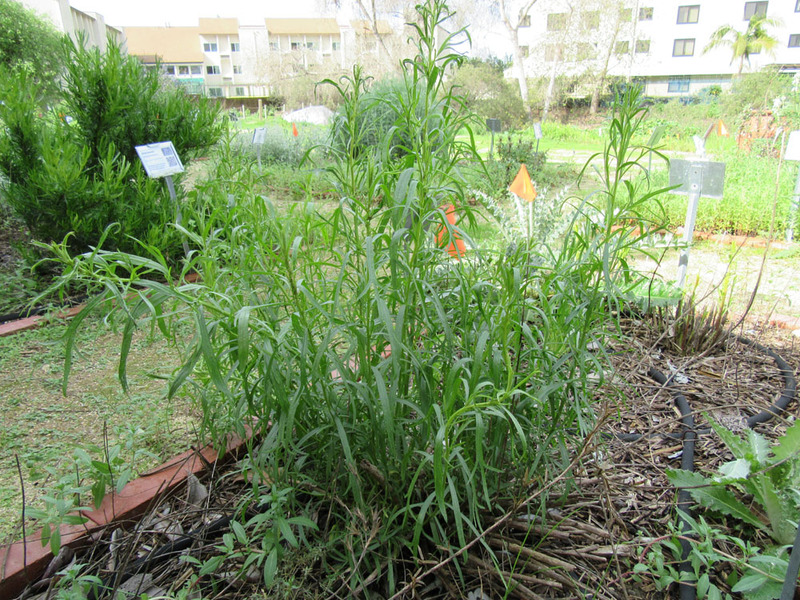 This month we’d like to share some additional recipes – ones that may inspire you to grow Wild tarragon in your own garden. We were surprised to learn that tarragon is a commonly used beverage flavor in Russia and the former Soviet-block countries. The tarragon is usually paired with citrus or other, slightly tart, fruits. We’ve included several simple recipes that you may want to try, with or without added alcohol. They are particularly refreshing on a hot day – and you can make the syrup ahead and store in your refrigerator for weeks to months. And while many cooks use tarragon to season meats and vegetables, Wild tarragon also adds a pleasant flavor to breads and other baked goods. It is often paired with potatoes or citrus fruit – excellent combinations to bring out the best of the complex flavors. We hope that the recipes below will inspire you to use Wild tarragon more creatively in your own kitchen. Tarragon-Citrus syrup can be used in many ways. Blanch tarragon sprigs by immersing for 2-3 seconds in simmering water, then rapidly rinsing in ice-cold water. Finely chop the tarragon (leaves and stems). Mix sugar and water in a sauce pan. Bring to a boil, then simmer for 5 minutes. Remove from heat. Pour syrup into a heat-proof glass or pyrex bowl. Add citrus juice and chopped tarragon to the syrup. Cover the bowl and let steep for 6-8 hours. Strain the syrup through a fine sieve or several layers of cheese cloth to remove tarragon. Add food coloring (optional) and store in a sealed glass jar in the refrigerator. It can be stored for up to 6 weeks. Place strawberries and sugar in a glass or other non-reactive mixing bowls. Stir. Cover and let sit at room temperature for several hours, stirring occasionally. 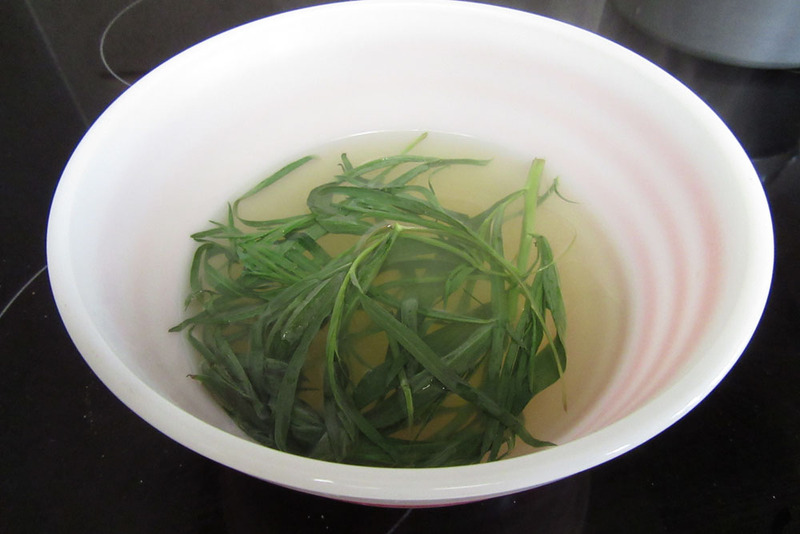 Wash tarragon in cool water; pat dry. Bruise tarragon by hitting with the dull side of a heavy knife or cleaver. Place tarragon and vinegar in a glass jar, being sure that vinegar entirely covers the tarragon (push down if needed). Cover with a plastic lid (or layer of plastic wrap and then a metal lid). Seal lid and let stand at room temperature to steep. Strain the strawberries from the strawberry juice using a fine sieve. Use the strawberries for another recipe. Pour the strawberry juice into the jar with the vinegar and tarragon. Make sure that tarragon is completely covered. Tightly seal the jar and place in the refrigerator to steep. Check for taste after 1-2 days and daily thereafter for up to a week. 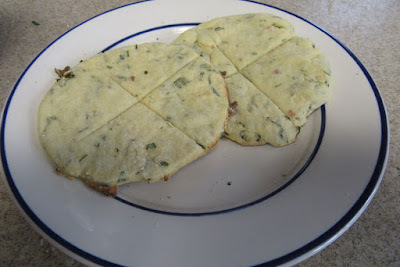 When tarragon flavor is to taste, strain out the tarragon using a fine sieve or several layers of cheese cloth. Return the syrup to a clean jar, cap and refrigerate (can be stored several weeks in refrigerator). To make a delicious beverage, combine 1 oz. syrup, 5 oz. sparkling water, 1 ½ oz. vodka or tequila (optional) and ice. Stir and enjoy. This pretty syrup would also be delish over fruits. Tattie scones are traditional fare for hearty Scottish breakfasts. They are also eaten in Ireland and the rest of the British Isles – and not just for breakfast. They make a unique bread for a light lunch with cheese and fresh fruits. They are also nice to accompany a dinner of fish or fowl. And they are a great way to use up extra mashed potatoes! Many recipes include both mashed and grated potatoes. Some use milk or eggs to moisten and bind the mixture. Our recipe is a very simple one, embellished with the flavor of tarragon. You might also consider adding other fresh herbs like chives or basil. These scones can be cooked on a stovetop griddle or baked in the oven. Pre-heat oven to 400° F (if baking in oven). Wash tarragon in cool water; pat dry. 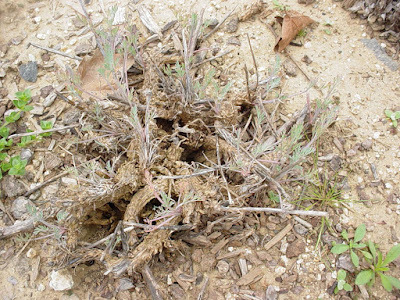 Remove leaves from large stems (discard – they are too big). 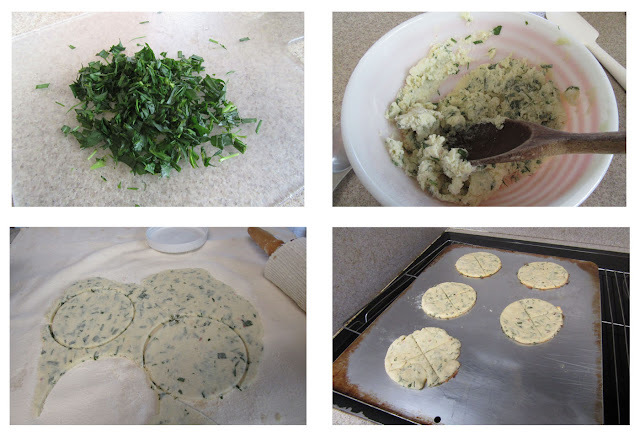 Mince tarragon leaves and small stems into small pieces with a knife or scissors (see above). Place all ingredients in a mixing bowl. Mix until completely blended. If dough is too sticky to roll, add a Tablespoon more flour, as needed. Turn the dough out onto a flour board or cloth. Either divide dough into 3 balls, then roll each ball out to a ¼ inch thick circle. Cut each circle into 6 wedges. Or, roll out the entire dough to ¼ inch thickness, cut into 5- or 6-inch rounds with a biscuit cutter or jar lid. Score each round with a cross, using a knife and cutting almost through the dough. This latter method is more traditional – and takes just a little more effort. Bake the scones on a greased cookie sheet for about 15 minutes, or until risen and golden brown. If cooking on a griddle, pre-heat the griddle, then sprinkle lightly with flour. Cook scones about 5 minutes, then flip, to cook both sides to a golden brown. Eat the scones warm, right from the oven (best). They can also be re-heated. Scones can also be frozen, either after baking or unbaked, separated by waxed paper to keep them from sticking. The last recipe has a secret ingredient that will keep your guests guessing for a long while. The ‘secret’ is, of course, Wild tarragon. We’ve tried this recipe both with and without the tarragon; it really is much better with. Preheat oven to 375° F. Mix together topping ingredients in a bowl. Mixture should be crumbly. To make the batter, first sift together the flour, baking powder, sugar and spices. Cream butter in a mixer bowl. Add egg and zest and mix well. Add dry ingredients, alternating with the milk & juice. Spoon ½ of the batter into a greased 8 x 8 inch baking dish or cake pan. Flour your hands, then pat the dough to spread evening in the pan. Sprinkle on ½ of topping mixture. Spoon in rest of batter, smooth it, then top with the remaining topping mixture. Bake 30-35 minutes, or until a toothpick inserted in the middle comes out clean. Remove from oven. Let cool at least 5-10 minutes. Slice and devour! Good warm or cool. 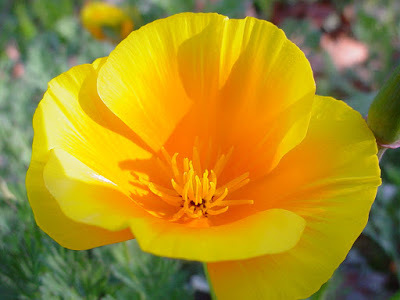 One of the more impressive spring perennials is the California poppy (Eschscholzia californica). With all the other spring-blooming treasures, we’ve yet to feature this native crowd-pleaser. So we’ll remedy that this month. The slightly tongue-tying scientific name is pronounced es-shuh-HOLES-ee-uh cal-i-FOR-ni-cuh. The genus name honors Dr. Johann Friedrich Gustav von Eschscholtz (1793-1831), an Estonian surgeon and botanist with Russian expeditions to the California coast in the early 1800’s. California poppy is the quintessential California plant; in fact, it’s the state flower. It grows throughout much of the state, with the exception of the hottest deserts and high elevations. It has always been an important player in plant communities all along the California coast. Early explorers wrote of the ‘fields of gold’ on the coastal hillsides. And California poppies, some started from seeds brought back long ago, brighten gardens throughout the world. In Los Angeles County, California poppy grows on Catalina Island, in the Santa Monica Mountains, on the Palos Verdes peninsula, in the L.A. Basin (from the coast to the San Gabriel Mountains), in the San Gabriel Mountains and in the Antelope Valley. It was collected by Los Angeles County botanists as early as the 1850’s. 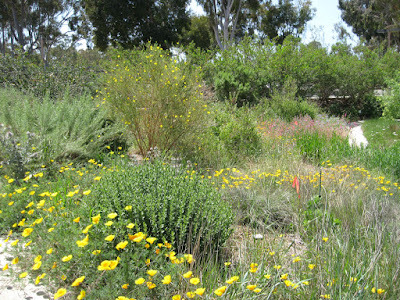 Specimens from all the major California plant collectors, from then to the present, reside in herbaria worldwide. 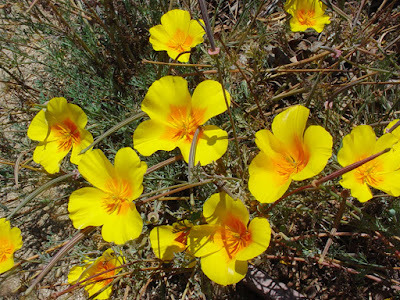 California poppy is a member of a wide range of plant communities, from the higher elevation Yellow Pine, Red Fir and Lodgepole Forests, to the lower elevation Foothill Woodland, Chaparral, Valley Grassland, Northern Coastal Scrub and Coastal Prairie communities. Although several regional sub-types have been proposed, all are currently lumped under the parent species. 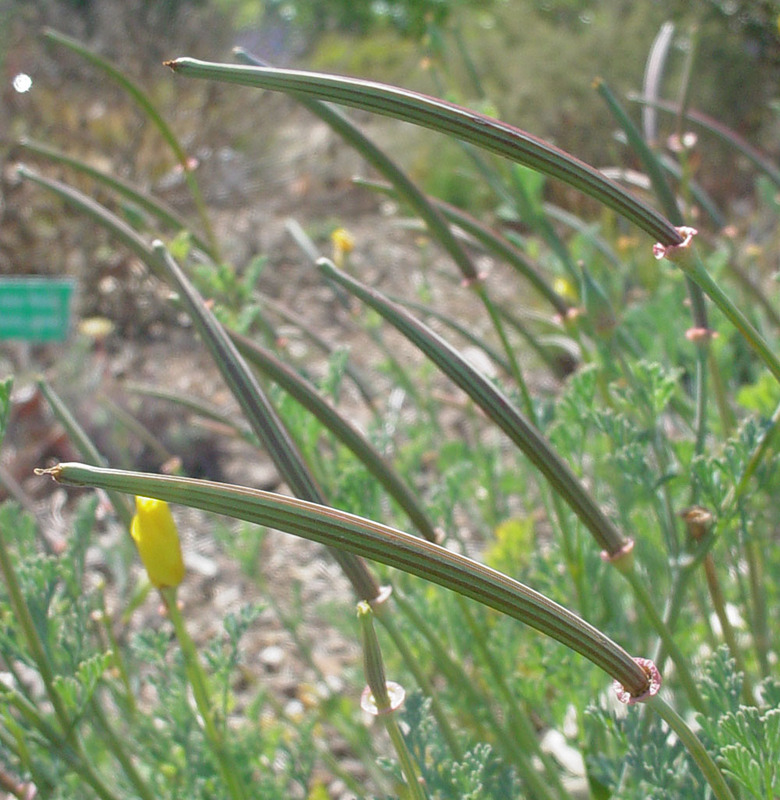 The coastal form of the poppy – still sometimes called Eschscholzia californica ssp. californica or Eschscholzia californica ssp. maritima - is bright golden yellow with a yellow-orange center. We still try to grow this form in our local gardens (and ruthlessly remove plants with ‘too orange’ flowers). We encourage California gardeners to search out seed sources from their own area, to help keep the regional types from disappearing. The more familiar ‘all orange’ form was originally found further inland in S. California. 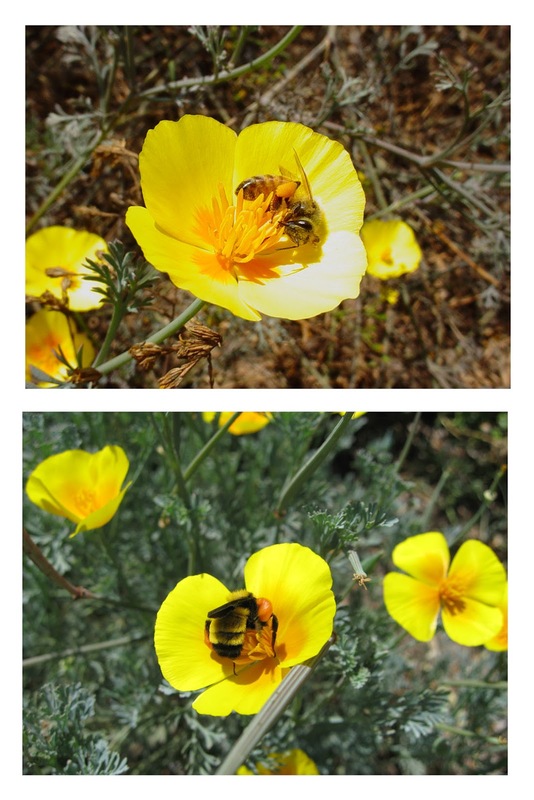 Good examples of the inland form can be seen at the Antelope Valley California Poppy Reserve, west of Lancaster (Los Angeles County). 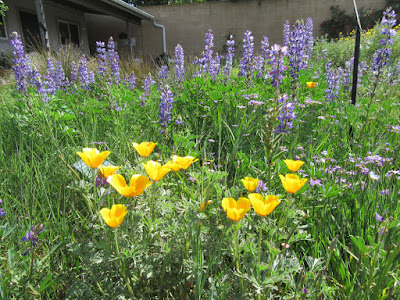 Check the wildflower hotline (http://theodorepayne.org/education/wildflower-hotline/) for what’s blooming, and where. California poppy is an herbaceous perennial, although it is grown as an annual wildflower in places with cold winters or very hot summers. Locally, plants die back to a stout woody stem/root with hot weather, remaining dormant until the cool, moist weather of late fall/winter. A summer rainstorm (or a little summer water) will sometimes trick them into emerging early – if the temperatures are not too hot. Individual plants can live many years; we know of one in our personal garden that is 35 years and going strong. 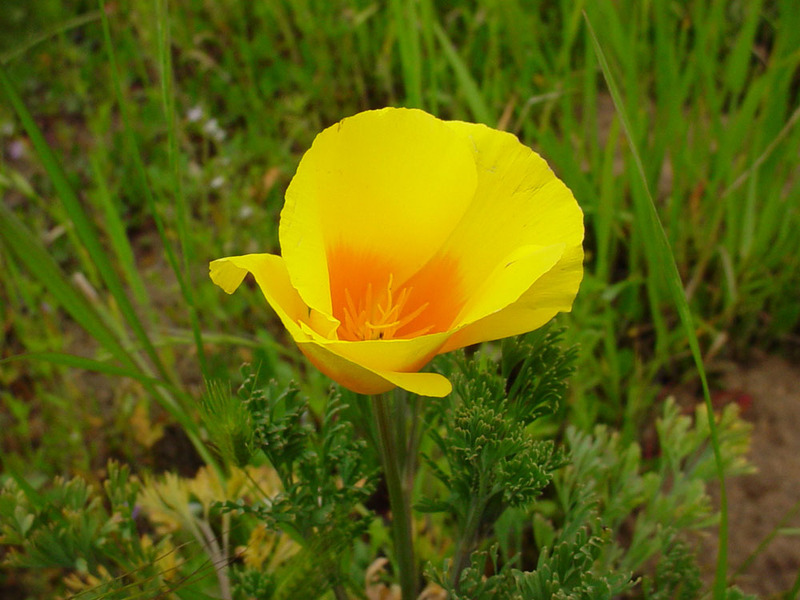 Many readers will be familiar with the appearance of California poppy. It’s a low-growing plant, the foliage never more than 12 inches (30 cm) tall and about as wide. The overall shape is loosely mounded. 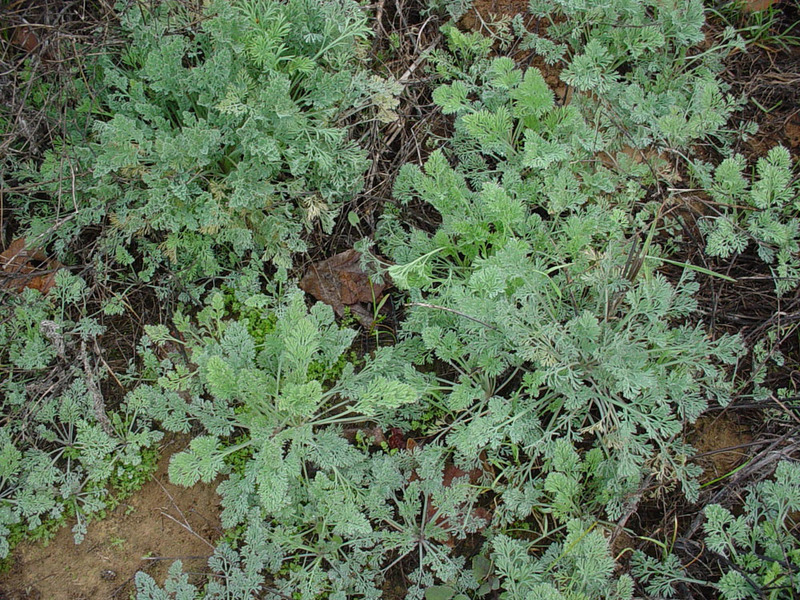 The leaves are pale gray-green to medium green and are finely dissected (see photo below). The plant has a delicate, refined appearance. That’s probably one reason why gardeners like it. 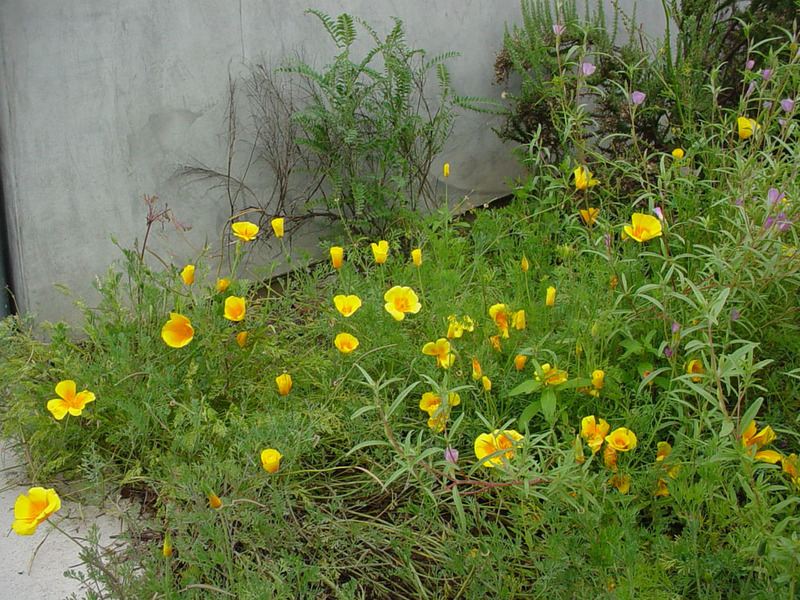 Many gardeners are also familiar with California poppy’s flowers, which are usually around 2 inches (5 cm.) wide on a slender stem. The flowers are simple yet uniquely beautiful; a fitting symbol of our California natural heritage. They have four delicate, fan-shaped petals. The petals are rolled into a cylindrical bud (above) and unfurl as the flower emerges, forming an open, bowl-shaped flower. Flowers open in the day and close-up at dusk (or on cloudy or windy days). One Spanish name for this plant is ‘dormidera’ or ‘the sleepy one’ – perhaps in reference to the floral closure. 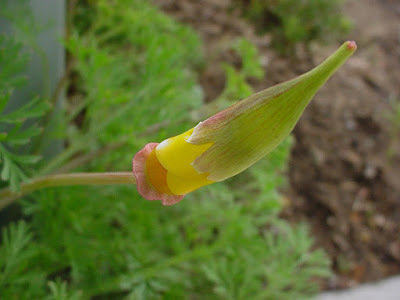 The sexual parts of the flower are conspicuous above the petals. 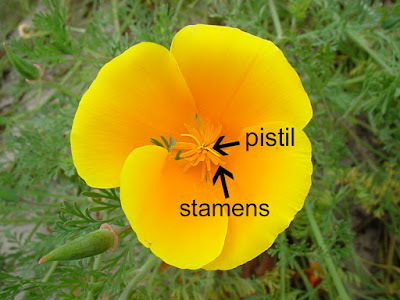 The female parts (pistil) are centrally located, with a stigma (top part) divided (see below). The stamens are several to many, around the stigma. 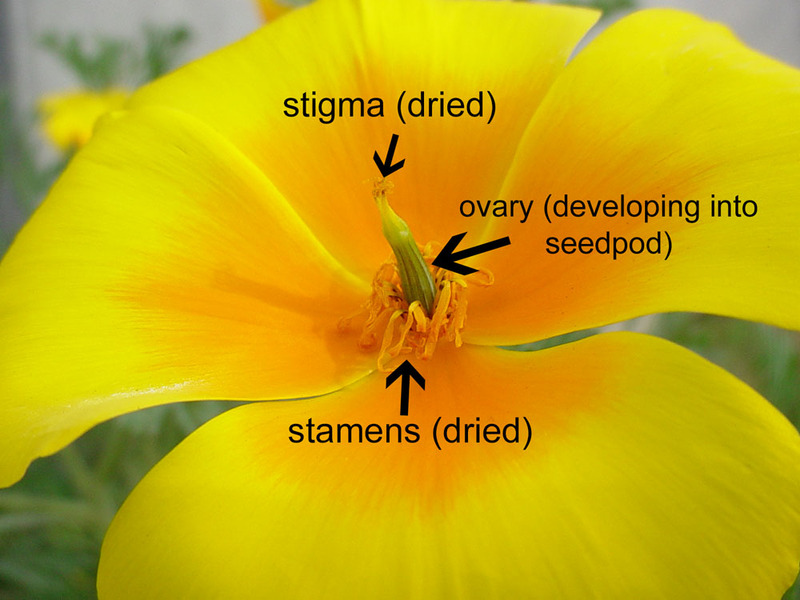 After pollination, the sexual parts wither, and the developing ovary becomes more prominent (below). 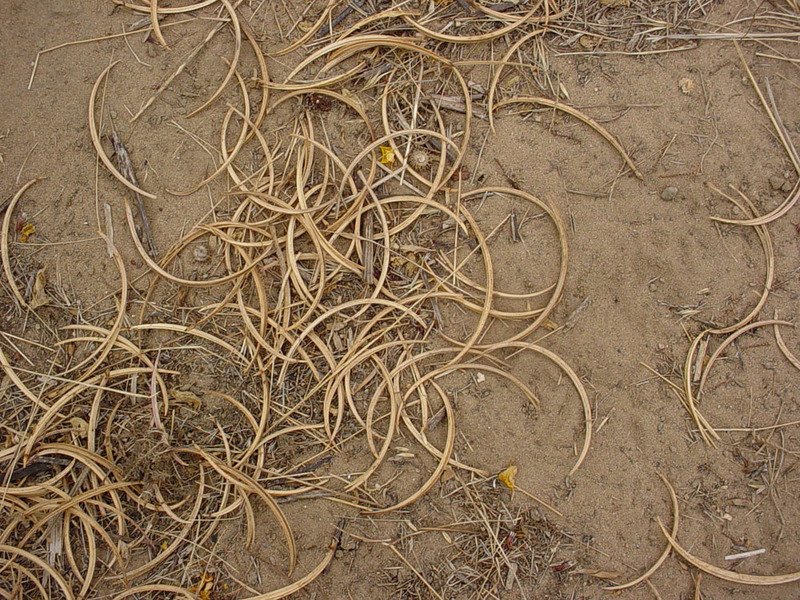 The petals ultimately fall off, leaving the seed pod. The floral architecture is relatively unspecialized and typical of the Poppy family (Papaveraceae). Flowers produce little nectar and are virtually unscented. Their pollinators are a wide variety of insects, from beetles to pollinator flies, bees and others. While there are beetles, we mostly see bees visiting the flowers in our gardens. It’s fun to watch them – whether European Honey Bees or native species – scrambling around in the floral bowl. The procedure’s a bit ungainly, but the bees seem to pick up (and distribute) plenty of pollen (below). 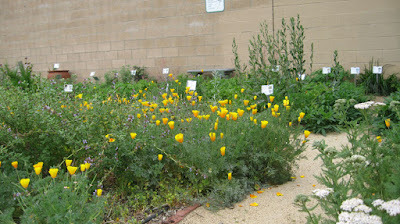 California poppies usually produce lots of seeds. The seeds are small, rounded and brown when ripe. You’ll know when the seeds are ripe: the dry pods spring open with explosive force, spreading the seeds. If you want to collect seeds, wait until pods become a purple-brown, almost ready to open. Snip off the pods and place them in a (well-closed) paper bag in a cool place. After they finish drying, separate the seeds from the dry pod pieces; then store seeds in a labeled glass jar or envelope in a cool, dark place. 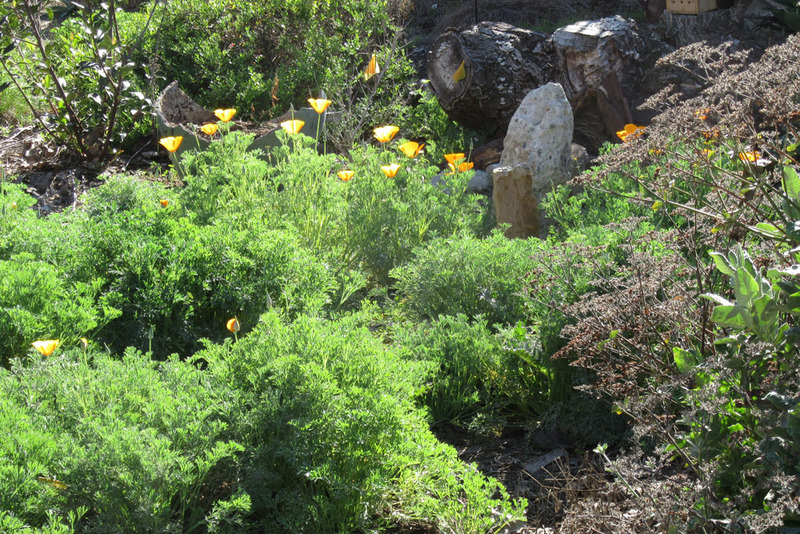 California poppies are good naturalizers, as long as a garden is not heavily mulched. You can let the plants go to seed – or collect seeds and give them as gifts, if you’ve already got too many plants. 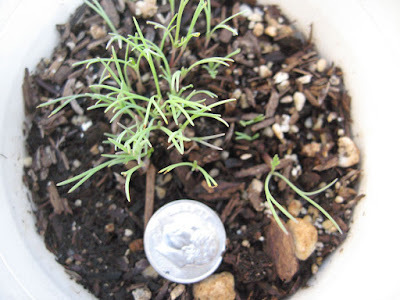 The seedlings are very distinctive (see below) and easy to pull up when young. 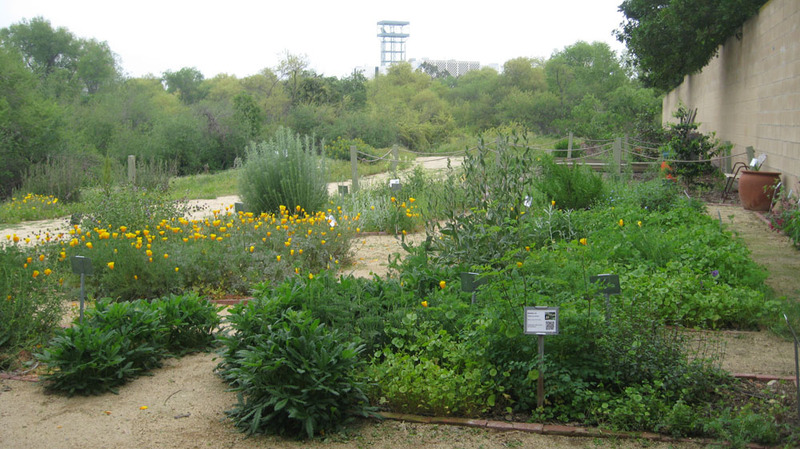 If happy, a few plants will produce offspring throughout a garden in a year or two. If you need to pull up some young plants (below) you can always dry them for use medicinally. Eschscholzia californica can be grown in most soils – sandy to clay. It does like sun (at least half-day) and either bare soil, thin leaf mulch or inorganic (gravel) mulch. A heavy layer of bark mulch will prevent seeds from sprouting (they need light). Sprinkle seeds out in garden beds with the fall rains (or in spring in colder climates). 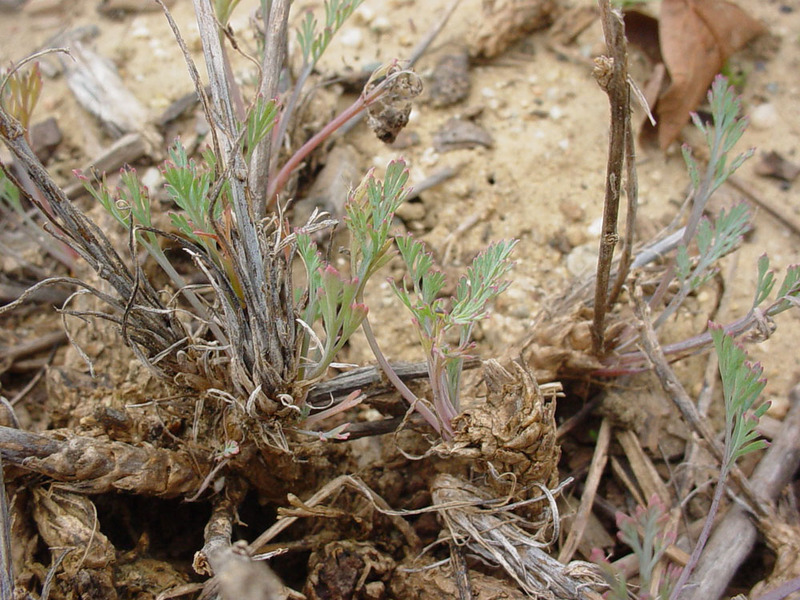 Seedlings are very susceptible to drying out (a good way to limit their spread). But plants (even last year’s plants) are very drought tolerant. California poppies have a stout orange taproot, allowing them to access deep water. In a ‘normal’ year, they may need no supplemental water. 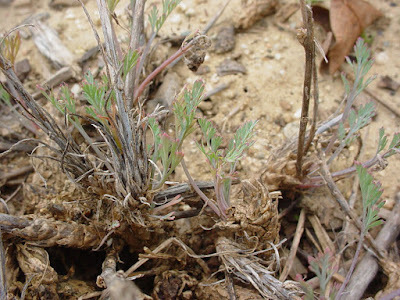 But in a dry California winter, plants need watering every 2-3 weeks, if rains don’t keep the soils moist. We like to let our plants gradually dry out after blooming slows down – usually about the end of April in our part of S. California. Plants will die back to the ground. 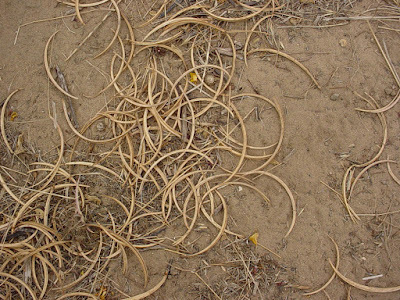 After plants have gone to seed, cut the dead leaves and stems back for a neater appearance. That’s really about all there is to it, since plants get along fine with little to no summer water and no fertilizer. 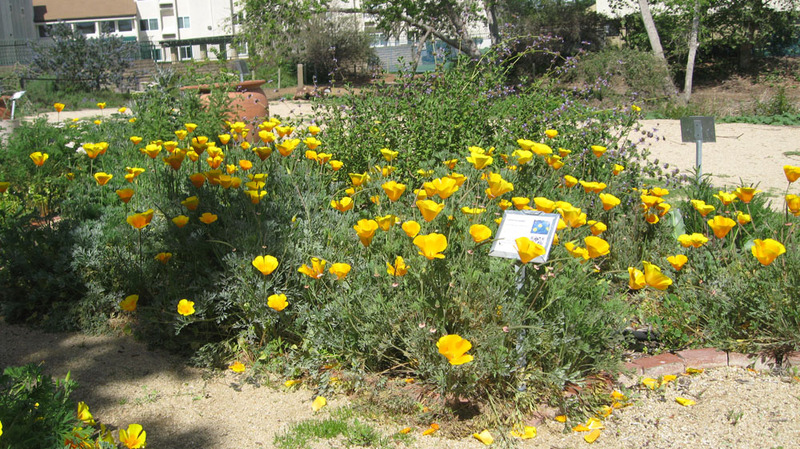 So why include California poppies in your garden? A better question is ‘why not’? They are our state flower. You can start them inexpensively from seed. They make a good filler between plants or when a new garden is getting started. And they naturalize, making them an excellent investment over time. They provide patches of golden accent, at a time when days may be gray and rainy. They look absolutely glorious with annual wildflowers, grasses and perennials. Since they are native to much of California, you can combine them with your own local native palette, creating a truly authentic regional garden. And pollinators and seed-eating birds will thank you for your thoughtfulness. We love to pair the gold of poppies with the blues and purples of Lupines, Blue-eyed grass, the Gilias and Phacelias. We get so many complements on these combinations; you may want to use them in your garden as well. And, of course, you can always find a place for California poppy in your herb or medicinal garden. 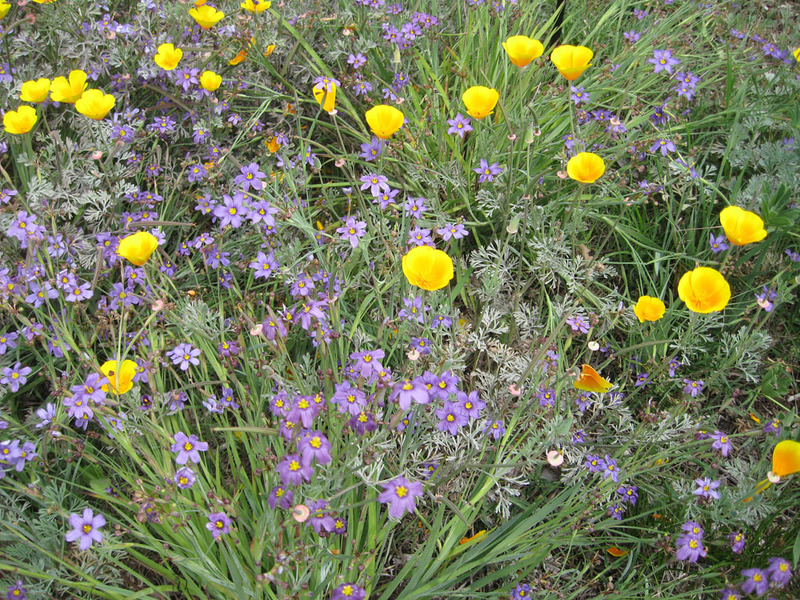 California poppy seeds can be used in any recipe calling for poppy seeds. The entire plant has long been used medicinally as well. Like all poppies, Eschscholzia californica produces chemicals with sedative properties. In the California poppy, these chemicals are mild and apparently not habit-forming. In old times, an infusion made from the whole plant was used to calm colicky babies and induce sleep in babies and children. The juice was applied directly for toothache. A cup of California poppy tea, made from dried plants and sweetened a bit, is a gentle sleep aid when taken half an hour before bed time (we know – we’ve tried it). It is reported to also help reduce anxiety, relieve headaches and calm tense muscles and nerves. It may prove to be an important treatment plant for the young and elderly alike. But as with any herbal medicine, care should be taken when using Eschscholzia californica. Adequate clinical trials to assess dosing, safety and effectiveness of California poppy are not yet available. The only way to determine these important properties, in a wide range of people, is through carefully controlled and conducted medical studies. 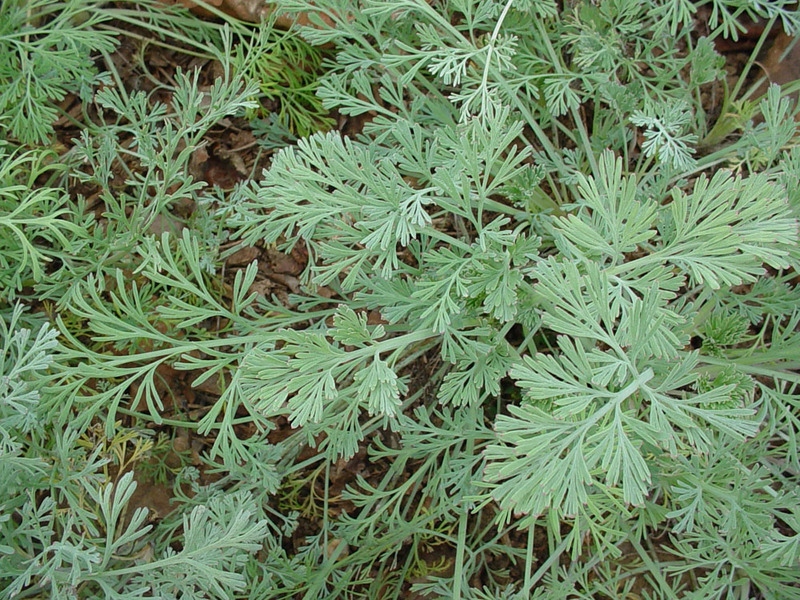 Until we have clear, scientific-based evidence, California poppy should be taken with caution, and only after consulting a medical practitioner. For more on the medicinal uses and cautions, see the references below. In summary, California poppy is a plant that belongs in California gardens. It’s our state flower and we’d love to see entire neighborhoods blanketed in yellow, as they were in times gone by. This plant is an important part of our natural heritage; an easy way to celebrate the place we call home. And we welcome non-California gardeners to enjoy a bit of California gold in their own gardens. We’re always happy to share the wealth!